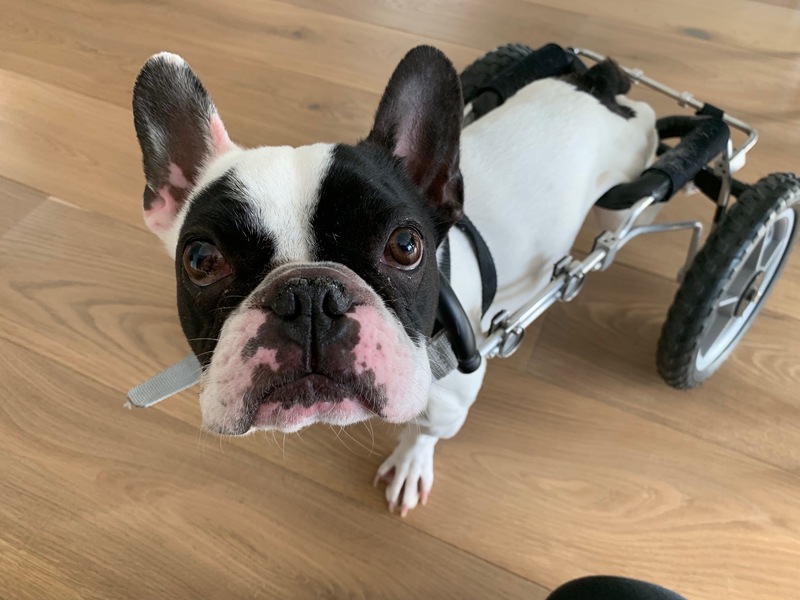 For this Malibu dog behavior session, we help Minor, a 4 year-old French Bulldog in a Wheelchair; teaching him directional commands and some hand targeting. Minor is not a fan of people he doesn’t know; barking and nipping at people who visit his home. This is even more problematic as his guardians are renovating his home. I had the guardian meet me outside and I set things up for success by leaving a trail of high value treats on the sidewalk. By the time he got to me, barking was the furthest thing on his mind. We sat down to discuss his dog behavior problems as well as tips to help a dog in a wheel chair. I first made sure that the guardians weren’t feeling sorry for him. Many people who have a disabled dog, baby it or try to do everything for it to help out. While this is natural, its debilitating and can actually hinder, slow down or stop a dog’s recovery. I have a good friend who is in a chair and I leaned on several of the lessons he taught me. His advice gave me great insight on things to do and things not to do. When the ability to do things on your own is taken away, the last thing you want is for people to do the things you can do yourself. While it may seem like you are helping a dog by picking it up and doing things for it, you are actually taking away opportunities for it to increase confidence by doing it itself. Not only that, building up strength and muscle coordination and mass are very important when recovering from a debilitating injury. While Minor was able to navigate the home on his own quite impressively, I wanted to give his guardians the ability to direct him verbally. You can learn how to teach a dog directional commands by watching the free dog training video below. Being able to more effectively communicate directional movements to a dog is one of those small things that will be very utilitarian and often used. Another exercise we went over was to teach Minor to target a human’s hand with his nose. I call this hand targeting and its a nice way for Minor to interact with his guardians to ask for things and an alternative way to ask him to come to them. I often practice a technique called Petting with a purpose where you ask the dog to do something to earn the praise. This boosts a dog’s self esteem, helps develop a healthy leader follower dynamic and gives the dog an opportunity to practice the skill or command. Since Minor obviously can’t sit while in a dog-wheel chair, asking for a hand target is a nice alternative. The more Minor feels like he earns his praise, the more self esteem and confidence he will get. We covered several other dog behavior tips to help a dog in a wheel chair in this Malibu in home dog training session. You can get a summary of them by watching the free dog training video below.